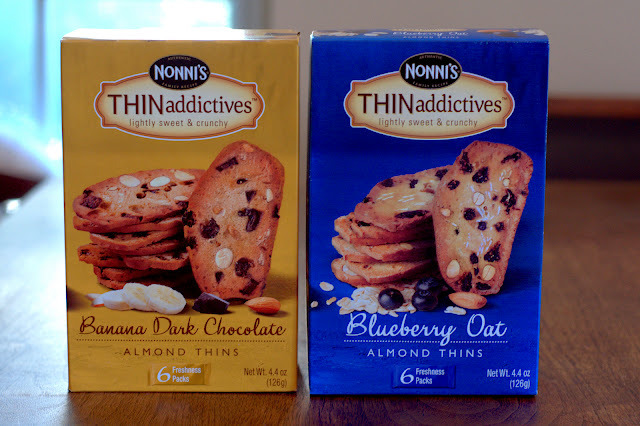 Nonni's THINaddictives are twice-baked treats that are "so thin, so crunchy, so addictive". I don't remember exactly when it happened or why it happened, but at some point in my younger years, my parents started buying huge plastic tubs of Nonni's Biscotti, and several members of my family became huge fans of the kind dipped in gourmet bittersweet chocolate. So much so that I nearly always kept a box of biscotti on hand when I went away to college because they reminded me of home. 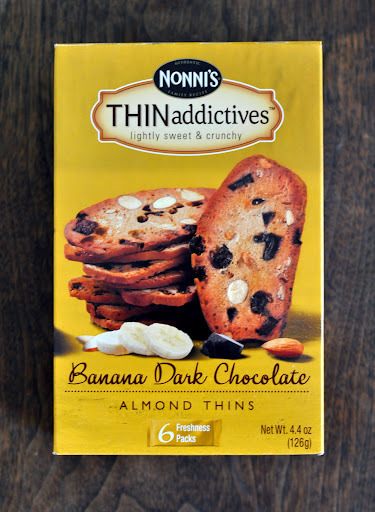 Because of my somewhat sentimental attachment to the Nonni's brand, I accepted an offer to try two new flavors of Nonni's THINaddictives -- Banana Dark Chocolate Almond Thins and Blueberry Oat Almond Thins -- which are conveniently packaged into six pre-portioned 100-calorie freshness packs. Both varieties are low-fat, low-calorie, low-carb, and low-sugar snacks, so you can feel good about eating them. The flavor combinations sounded intriguing, and I was curious to see how they'd stand up to my well-established opinions about the Nonni's brand. The Banana Dark Chocolate Almond Thins are made with real banana chips, semisweet chocolate, and California almonds. When I opened the box of the Banana Dark Chocolate Almond Thins, I had a hard time finding a package that didn't contain thins that were broken into small pieces. Thankfully, all of the almond thins in the sixth package were in tact, so I was able to set up the above shot. 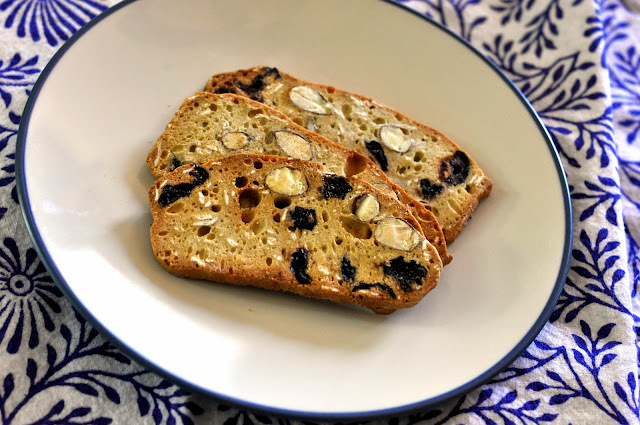 Next, I tried the Blueberry Oat Almond Thins, made with real blueberries, oats, and California almonds. 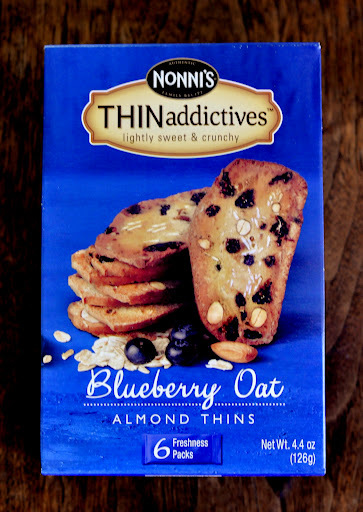 I enjoyed the flavor of the Blueberry Oat Almond Thins more than the Banana Dark Chocolate variety. The thins were crunchy as advertised, but even though I liked the taste of them, there was just something about them that wasn't sitting well with me. It wasn't until the slight rash appeared on my skin that I decided to read the list of ingredients. It didn't take long to find the source of the problem. Sure, the Blueberry Oat Almond Thins contained blueberries... but they also contained BLUEBERRY-INFUSED CRANBERRIES. You guys know I'm allergic to cranberries, right? It suddenly didn't matter whether I liked the flavor at all. The presence of cranberries meant that the rest of those THINaddictives were off limits. At the end of the day, I went 0 for 2. 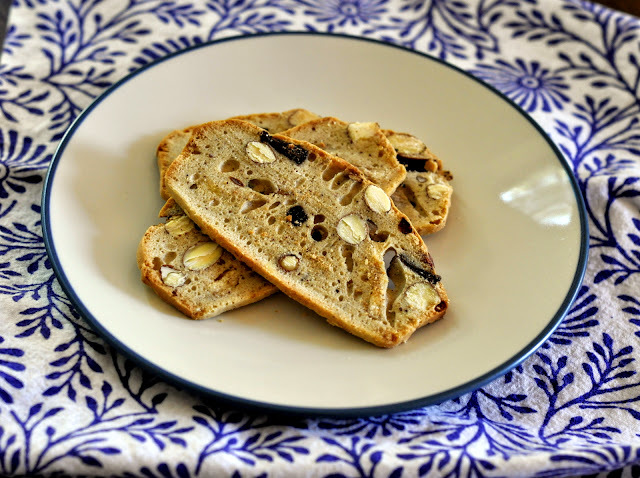 While I love the concept behind the THINaddictives, I'd much rather go back to the classic biscotti -- I already know they make me happy, they remind me of my family, and, if I stick to the Cioccolati Biscotti, there's no risk of having an allergic reaction when having a snack with my morning (or afternoon) coffee. PS. This incident made me learn my lesson (again) -- ALWAYS READ THE LABEL FIRST. Taste As You Go Disclaimer: I was provided with product samples of Nonni's THINaddictives at no cost to me. I did not accept monetary compensation for writing about these products or about my experiences while using them. All opinions expressed are my own.